She’s afraid she won’t get a tip when selling a product to a client. She’s afraid she’ll turn her clients away and lose credibility or come across as pushy if she tries to sell more retail. While Lisa realises that being a great stylist requires creativity and passion, she doesn’t want to see the fact that being a guru requires you to know the science of hair and scalp. If she educated clients on how to get thicker, healthier hair, they’d feel better about themselves, which would ultimately take her reputation to the next level! Think about it like this. Lisa gets$/€/£45 for a cut and style. If you up your prices for Lisa’s time, you run into the danger of losing clients to another salon right? So how do you expand? Do you try to get more new customers? If you’re busy, then you’ll have to hire another stylist, and that’s more of your valuable time and most importantly, a lot of money in overheads. The answer comes down to selling more retail. If Lisa – who styles 12 people a day, five days a week – can get to the point where 50% of her clients are spending $/€/£10 on products on every visit, that’s a lot of money! Lisa currently gets 60 clients a week at an average of $/€/£40, 46 weeks a year. That’s $/€/£110,000 pounds a year. A lot of money right? What if every second client bought $/€/£10 worth of products? That’s an increase of $/€/£5 per customer. Now, look at the figures: 60 clients a week, at an average of $/€/£45, 46 weeks a year. That’s almost $/€/£125,000 pounds. A total of $/€/£15,000 more without getting a single extra client through the door. If you have 4 Lisas? That’s $/€/£60,000 extra in a year. Related | Download The Salon Owner’s Ultimate Guide To Shaping a Retail Culture here! Get your commission right on products and be generous. Would you rather reward a stylist for selling more retail, or watch them take home a tip that you’ll never see again? A commission is a win-win! Give a monthly prize for salesperson of the month and come up with a fun name for it! Put a chart in the staff room that clearly shows who’s winning month-on-month. Making a competition out of selling more retail is a great way to motivate your team! Continually quiz your team on products. Set a conversation agenda for your stylists and therapists. Start off by getting them to tell the client what products they are using. Generally, you spike the clients’ interest, and they’ll end up asking “Oh how much is it?”, or “Can I get that in any salon or supermarket?” etc. Also, they’re more likely to bring up other problems once you explain why the products work – thus, giving you an opportunity to upsell. Never justify the price to the client unless they hit you directly with a question such as, “But I can get shampoo anywhere for £5 cheaper?”. Explain that if it lasts six weeks, it’s only a few pennies a day, and what it’ll do for your hair is far superior. Mention organics, natural ingredients, etc. educate. Educate. EDUCATE! Put a loyalty scheme in place, but not a traditional one. Here in Phorest, we recommend using our TreatCard. People get points for $/£/€ they spend. Once they’ve built up enough points, you can treat them to a product they’ve never had before. Over 30% of people end up buying it at a full price the second time around, increasing average spend! Research shows that 8 out of 10 people buy more with music on. We’re not saying turn it up to 11, but have some nice feel-good music in your salon. A point of purchase display is responsible for 80% of impulse buys. Make your product shelves pretty and placed in line-of-sight, for instance, near the counter. A lack of this will lose you 9 in 10 sales! 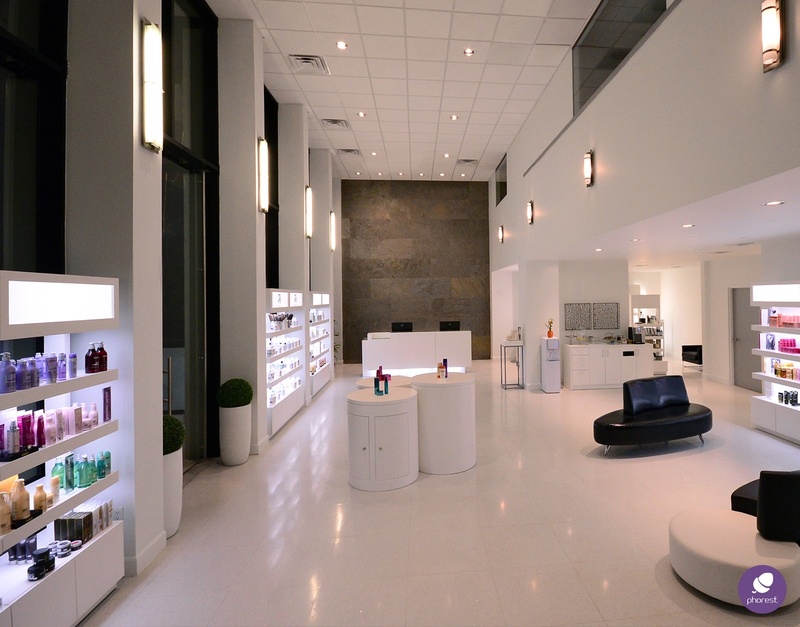 The longer a client stays in a salon, the more likely they are to buy. Of course, you can’t just leave them in the corner, but always avoid rushing clients. Phorest Salon Software has a product reminder feature! What it is in a nutshell: a little screen pops up at check-in or pay, reminding the stylist or therapist what the client has previously bought and when they’re due to replace it. Click here to learn how to set it the prompt up! This article was originally published on February 13th, 2014. It has since been updated with new content and advice.